Never one to leave a good thing to be forgotten, Hudson are back with the third installment of the ever present Bomber Man series, and with this one comes a few changes. Apart from our dumpy little hero having lost a little weight since '93, the gameplay has also been altered significantly. While still retaining the basic bombing action, completing a level now no longer requires you to destroy all enemies on screen. Instead, you have to find and destroy a set of pillars on each level and these will unlock a broken piece of amulet from its protected dome. Collect the piece and all remaining destructible blocks turn into coins and you have about 15 seconds to collect as many as possible. Another major addition is kangaroo-type animals that you can jump on and ride. These have special abilities, like jumping and such and also count as an extra hit in case you walk into an enemy or stupidly blow yourself up. Graphics and level design has improved yet again for this update, with the levels looking far less rigidly planned and more natural. Nice little touches add to the game, like the ripple effect on the water levels, and music again is jolly and catchy. Multi-player is better than ever with the addition of different characters to play (fat, tiny, old...). If you're a big Bomber Man fan or new to the series then you should have this game, but if you have either of the prequels and are only vaguely interested, then maybe you should think twice, but this is the best version of the three. 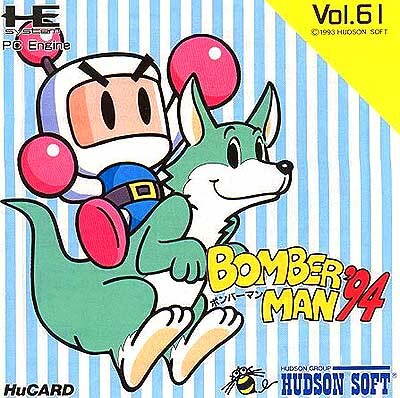 The last Bomberman title to be released on the PC Engine, and in many estimates, the best. If you're unfamiliar with the formula (where have you been?! ), the games focus around a pattern of both destructible and indestructible blocks, and the use of a delayed charge to destroy both blocks and enemies. The series has proven to be something of a legacy for Hudson. So much so, that if anything gets produced in modern times that has anything to do with Hudson, odds are it's a new Bomberman release. In this instance, one of the more notable changes, comes in the form of Louies, pastel coloured Kangaroos that provide an additional hit, and bestow you with an extra ability - a full screen dash, a jump, the ability to kick a bomb, or just a lil dance. The common consensus, is that Bomberman '93 holds the edge in terms of single player, but '94 is the better multiplayer. And multiplayer is Where Bomberman excels. You can not only customise your character to be an old man, a police officer, or a robot, among other things, but you also get to choose from a selection of whacky maps. You'll have stages featuring teleports, conveyor belts, or simply igloos that conceal bombs from view. Put simply, this is arguably the best party game on the system, perhaps even on any system. It's a good enough reason to go out and buy a multitap and as many pads as you need. Simple enough for anyone to play, and yet anyone stands a pretty good chance against a very good player, just because it can get so chaotic. This game takes a simple formula and tweaks it to make an unforgettable classic.